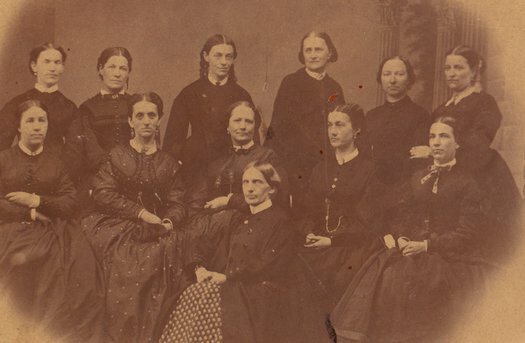 The Ladies Volunteer Aid Association was formed in 1861, and their first meeting held on October 18 of that year. Officers elected at the first meeting were Mrs. S. Clapp, president: Mrs. W. A. Dart, vice-president: Mrs. J. H. Seeley, secretary, and Mrs. Luke Usher, treasurer. Directresses were Mrs. E. D. Brooks, Mrs. C. W. Leete, Mrs. A. M. Smith, Mrs. H. M. Story, Mrs. E. W. Foster, Mrs. H. H. Peck, Mrs. E. Crary, Mrs. B. Hobart, Miss C. Clark, Miss M. A. Isher, Miss Jennie McChesney, Mrs. O. C. Cole and Mrs. L. Smith. This organization was formed in response to a call made by the War Department "to the Union-loving women of America on behalf of those noble fellows who have dedicated themselves to their country." Not only was this call answered by the Potsdam women, but by all the women of St. Lawrence Country. 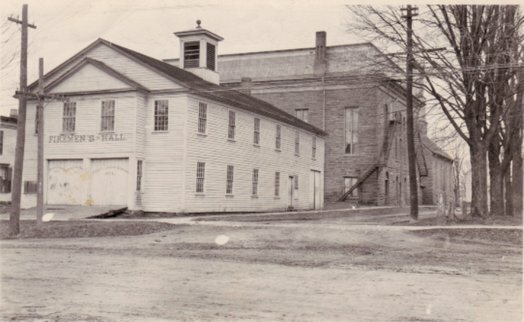 Organizations were also formed in Bicknelville (the Women's Benevolent Association), Pierrepont and Stockholm. The ladies met once a week, and the articles they forwarded to the camps and to the Sanitary Commission in New York were extremely generous. In addition, the groups earned money through suppers and luncheons so that they could purchase items. On Thanksgiving Day, 1861, the ladies of Potsdam earned $100 by giving a supper for the benefit of the Ladies Aid Association. The young people of the Village gave two festivals for this purpose, raising a total of $142. In June, 1862, the organization was renamed The Ladies Auxiliary Relief Association. Its purpose was "to render aid to the Sanitary Commission of the United States". [This Sanitary Commission eventually became the American Red Corss] The new officers of the Relief Association included Mrs. Rev. E. W. Plumb, president; Mrs. Rev. O. C. Cole, vice-president; Miss L. A. Partridge, secretary; and Mrs. C. T. Boswell, treasurer. The members of the Relief Assiciation met at the Fireman's Hall every Thursday and Friday. All ladies of Potsdam were urged to work, or to give their money, or both if possible. The contributions of the ladies of Potsdam in this manner continued through the War.